For several years, the Mascoutah Chamber of Commerce had discussed the need for major improvements to Santa’s home in Mascoutah. 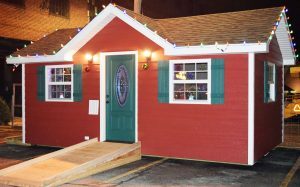 The Santa Hut had been in use for more than 50 years and was not, and could not, be made ADA compliant. There were also major structural issues with the building. 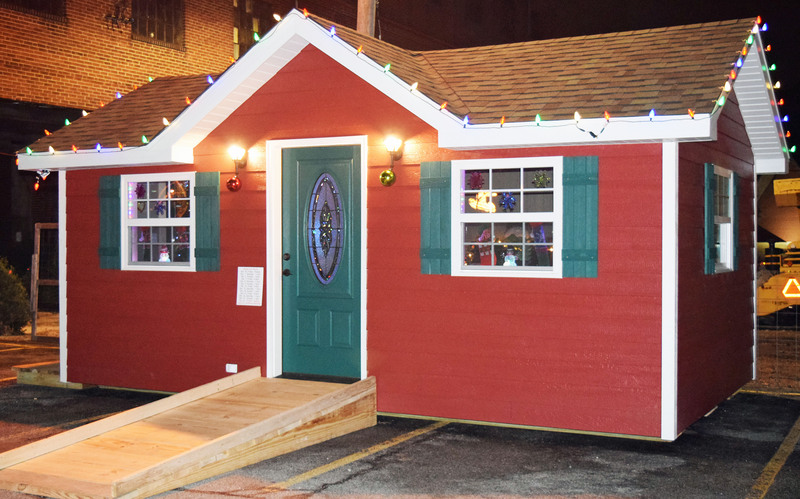 At the end of 2017, the decision was made to explore the possibility of replacing the Santa Hut. Kathy Welker, owner of Flowers, Balloons, Etc. and Chamber Board Member, agreed to coordinate the project for the Chamber. She contacted Corey Anstedt of Anstedt Construction. He agreed to be the general contractor for the project. What the Chamber had not counted on was Corey and his employees and friends donating all of the labor for the project. This immediately made the project much more feasible. Those helping Corey included Michael Bush, Rob Anstedt, Jeremy Clement, and Carl Welker. After several meetings, a plan was agreed upon and construction was started in late summer. As word of the project spread through the community, several groups, organizations, and individuals gave financial support to the project. Groups and individuals making substantial financial contributions include, Mascoutah Township, South Mascoutah Jaycees, Mascoutah Noon Lions, and Donna Mae Schlueter. Several others made significant contributions of time and expertise. These include Larry Linck, Dean Mattern, Ryan Haas, Tyler Swalls of the Mascoutah city electric department and several other city employees. Marian Albers and the staff of the Mascoutah Public Library decorated the interior. Brian Menchau and Steve Beimfohr constructed the trailer to transport the building. The Chamber would also like to thank Assistant City Manager Mike Bolt for his advice and support throughout the construction process. As stated previously, one of the goals of the new building was to make it accessible to everyone. When the original plan for the construction of a ramp didn’t work out, Pat McMahan and Ken Hamman of the MIA stepped up to construct a temporary ramp for use this year. Carrie Leljedal of the Leu Civic Center Board knew of a permanent ADA compliant ramp and arranged for it to be donated. The ramp will be modified and will be in place in 2019 when Santa comes to Mascoutah. The members of the Chamber are grateful for all of the support we have had in bringing this project to a successful conclusion. We would also like to thank Santa and Mrs. Claus for always making time in their busy schedules to come to Mascoutah and meet with all of our boys and girls and working very hard to make sure they have a nice Christmas. In many communities, a project like this would not be possible. Mascoutah is not just any community, and projects like this happen quite often. That is why we all live in a very special place. 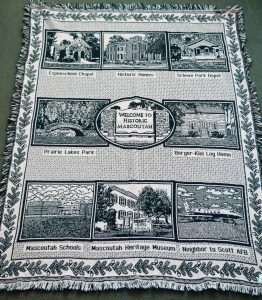 The Chamber now has new, updated, afghan throws available. 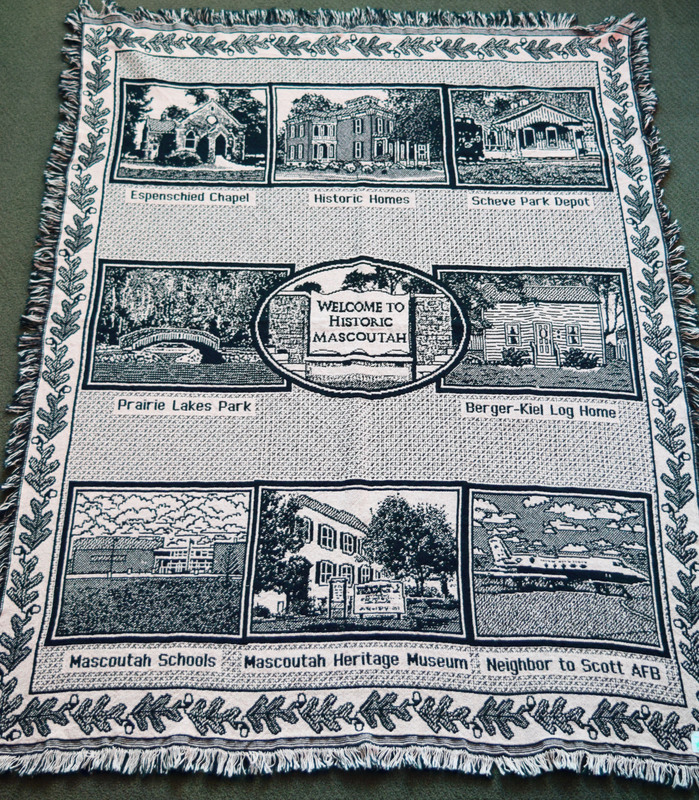 The throws depict 9 Mascoutah icons and are available in four colors. The cost is $40 and are currently available at Flowers, Balloons, Etc. and the Visitor’s Center. These throws make excellent Christmas or any occasion gifts. 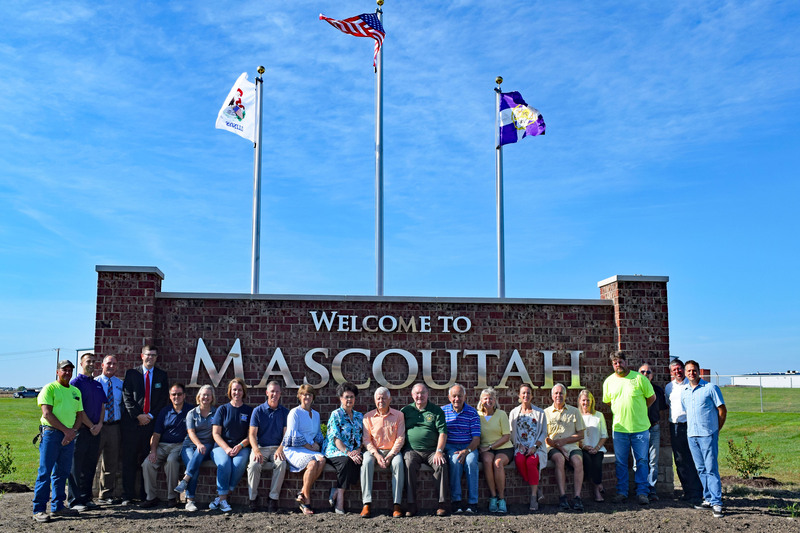 After several years of planning, the new Mascoutah welcome sign was dedicated with a flag raising and ribbon cutting. The project was a result of efforts by the City of Mascoutah, the Mascoutah Tuesday Women’s Club, and the Mascoutah Chamber. Funding for this new welcome sign was provided by the city and design was a joint effort of all of the organizations. This will welcome people to our city for many decades to come.